‎"We need to flatten entire neighborhoods in Gaza. Flatten all of Gaza. The Americans didn’t stop with Hiroshima--the Japanese weren’t surrendering fast enough, so they hit Nagasaki, too." In other words, kill all the brown-skins. Mass-murder them. If it takes genocide to secure Israel's illegal occupation of Palestine, so be it. There is no middle path here--either the Gazans and their infrastructure are made to pay the price, or we reoccupy the entire Gaza Strip. This led to a discussion. 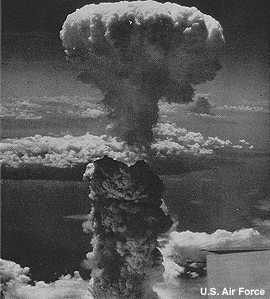 First Samantha:Why is it that America never self-examines what happened in Hiroshima and Nagasaki? And even more than that, why does it seem Japan never calls us on that hypocrisy?Conservatives shout down anyone who re-examines Hiroshima, or Native American history, or the Founding Fathers. Etc. They're all about about upholding the myth of white Euro-Christian supremacy. Not assessing the facts rationally. Then Mike:my uncle John was in the South Pacific training for a land invasion of Japan when Truman nuked Hiroshima and Nagasaki. We were expecting a million casualties. It was expected the Japanese would have suffered far higher losses. Uncle John did not second guess the dropping of the bombs. Apparently your uncle wasn't aware of the huge controversy surrounding the bombing and our possibly fictional "expecations." He should've questioned authority, like me, rather than swallowing it blindly. Debate over the atomic bombings of Hiroshima and NagasakiSupporters of the bombings generally assert they caused the Japanese surrender, preventing massive casualties on both sides in the planned invasion of Japan: Kyūshū was to be invaded in October 1945 and Honshū five months later. It was thought Japan would not surrender unless there was an overwhelming demonstration of destructive capability. Those who oppose the bombings argue it was simply an extension of the already fierce conventional air raids on Japan and, therefore, militarily unnecessary, inherently immoral, a war crime, or a form of state terrorism. At least one historian states that the Soviet declaration of war on Japan had more of an effect than the two nuclear bombings (cf. Tsuyoshi Hasegawa).For instance, what did your uncle say to the alternative of threatening Japan with offshore explosions until they realized our resolve? If successful, that would've prevented the casualties on both sides. I guess we'll never know since the US went straight for mass murder rather than trying a moral alternative. Most Americans also didn't second-guess the attempted extermination of the American Indian. Most Americans like to kill brown-skinned people at the drop of the hat.Uncle John was just happy to survive. War is a damn terrible business, but it is a stretch to compare the American Holocaust that befell the American Indian and the dropping of the bomb on Japan. And not all stood by quitely as America's First People were dispossessed and slaughtered.As I tweeted: For our "national security," the US killed innocent American Indian, Japanese, Vietnamese, and Iraqi civilians. Apply to Israel and Gaza. It's a stretch to myopically claim that America's documented racism had nothing to do with the callous disregard for brown-skinned life in the cases above. Israelis are white, not brown? Ashkenazi JewsAlthough in the 11th century, they composed only three percent of the world's Jewish population, at their peak in 1931, Ashkenazi Jews accounted for 92 percent of the world's Jews. Today they make up approximately 80 percent of Jews worldwide. Most Jewish communities with extended histories in Europe are Ashkenazim, with the exception of those associated with the Mediterranean region. The majority of the Jews who migrated from Europe to other continents in the past two centuries are Ashkenazim, Eastern Ashkenazim in particular.Ashkenazis are not the descendants of the Ancient IsraelitesAshkenazim, the Ashkenazim are the Jews whose ancestors lived in German lands...it was among Ashkenazi Jews that the idea of political Zionism emerged, leading ultimately to the establishment of the state of Israel... In the late 1960s, Ashkenazi Jews numbered some 11 million, about 84 percent of the world Jewish population. --Encyclopedia Americana (1985)Who are the Ashkenazi Jews?At the founding of Israel in 1948, Ashkenazim made up 80 percent of its Jewish population. However, due to the large intake of Jews from Arab states and higher birth rate among them and Sephardim, the proportion of Ashkenazim in the Israeli Jewish population had fallen below 50 percent by the mid-1960's. Nowadays, due to the large-scale emigration of Jews from the former Soviet Union from 1990-99, Ashkenazim have acquired a narrow majority in Israel. --Dilip Hiro, author and journalist, in his 2003 book The Essential Middle East: A Comprehensive GuideIsrael's founders and a majority of today's Israelis are Caucasian rather than Semitic. 'Nuff said. For more on the Indian-Palestinian connection, see Gazans, Indians Have Right to Resist and Gaza = "Largest Indian Reserve."